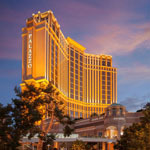 Are you looking for the best hotel on the Las Vegas Strip? Below you will find the top 10 best resort hotels on the strip. We rated each property from a scale of 1 to 10 and primarily factored in the AAA Diamond rating, Expedia rating, and TripAdvisor rating for each. We also have listed the price range you can expect to pay for each hotel. The low price is typically the lowest price you will find for a room – normally for a non-peak weekday. The high price is what you could expect to pay on a popular weekend. When hotel rooms are in high demand for popular sporting events or large conventions you might even have to pay more. If you see a room rate below our lowest listed price you should book that hotel right away because it is a great deal.